In the early mourning hours of February 25, 1942, an unidentified flying (U.F.O.) object flew over LA County that sparked an air raid alert. Searchlights and Guns were locked onto the object for about a an hour. 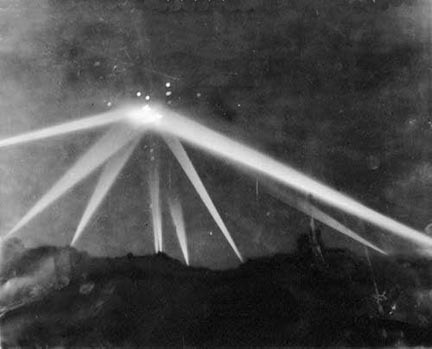 The picture below appeared in the LA Times in a story about the Battle of LA It clearly shows a night time defensive response to an air raid. Witnesses told LA Times reporters that the bombs exploded in rings around the object. There were hundreds of thousands of witnesses to the U.F.O. as it traveled apparently without being in any hurry while our military tried very hard to knock it out of the sky. Once the object had slowly traveled out of range of our guns the battle was over. Since Pearl Harbor had happened only a few months before it was easy to believe that the Japanese had made the flight. The object didn’t display any signs of hostility. The Government simply said that the craft they were shooting at was unidentified. They let the public ASSUME that the craft had been Japanese.